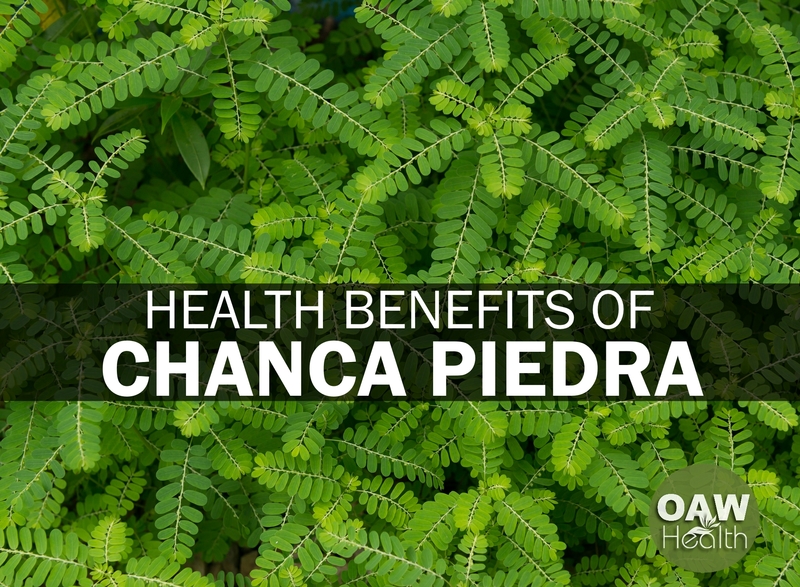 The health benefits of chanca piedra, also known as phyllanthus niruri, are many. Chanca piedra is a common tropical plant found in areas along the coast as well as the Amazon rainforest. It is usually found in abundance, with spreading tendencies much like common weeds. Phyllanthus niruri is also known by the more common names of “stonebreaker” or “seed-under-leaf”. Even though the literal translation of chanca piedra is “stone breaker”, it effectively softens both kidney stones and gallstones for easy passage out of the body. Research done in Brazil at the Federal University of Santa Catarina in 1984 on Chanca Piedra revealed an alkaloid (phyllanthoside) in the leaves and stem with strong antispasmodic activity. 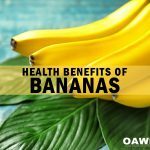 It served as a relaxing agent for smooth muscles. It was concluded that its spasmolytic action accounted for the efficacy of chanca piedra in expelling stones. Brazilian researchers have also discovered powerful, long-lasting pain-blocking activity in the roots. Chanca piedra is also known to help with liver issues. 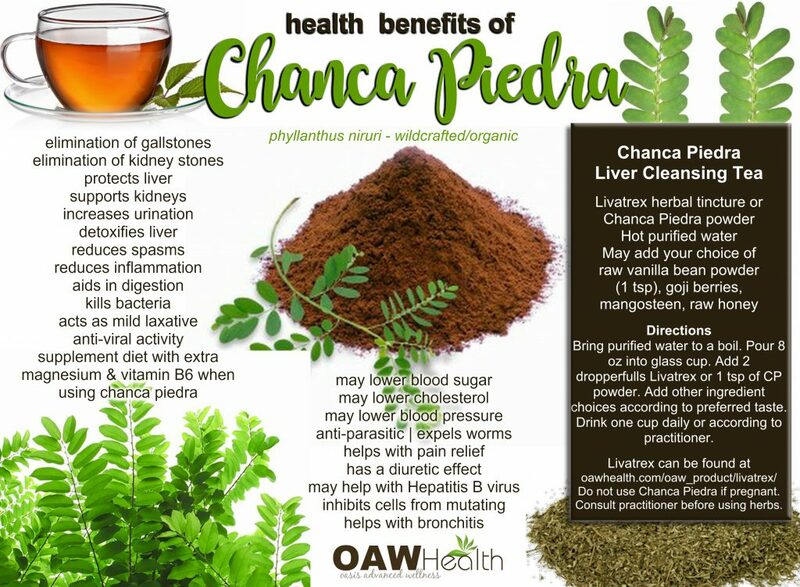 The Patel Institute of Pharmaceutical Education and Research conducted a study which suggests compounds in chanca piedra may be a valuable component to a multiple herb, liver-protection formulation. Bring purified water to a boil. Allow to cool just a bit. Pour 8 oz into glass cup. Add 2 dropperfulls Livatrex OR 1 tsp of chanca piedra powder. Add other ingredient choices according to preferred taste. 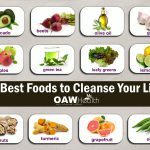 Drink one cup daily or according to practitioner. Livatrex can be found at here. CAUTION: Do not use chanca piedra if pregnant. 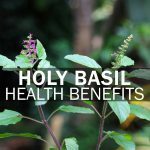 Always consult with a knowledgeable healthcare practitioner before using herbs. May potentiate insulin and antidiabetic drugs. This plant contains a naturally-occurring phytochemical called geraniin. This chemical has been documented with negative chronotropic, negative inotropic, hypotensive and angiotensin-converting enzyme inhibitor effects in animal studies with frogs, mice and rats. As such, this plant may potentiate antihypertensive drugs, beta-blocker drugs and other heart medications (including chronotropic and inotropic drugs). 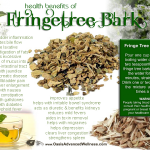 Consult a knowledgeable healthcare practitioner before using herbs. (1) Nishiura JL, Campos AH, Boim MA, Heilberg IP, Schor N (October 2004). “Phyllanthus niruri normalizes elevated urinary calcium levels in calcium stone forming (CSF) patients”. Urological Research 32 (5): 362–6. doi:10.1007/s00240-004-0432-8. PMID 15221244. (2) Jump up ^ Micali S, Sighinolfi MC, Celia A, De Stefani S, Grande M, Cicero AF, Bianchi G (September 2006). “Can Phyllanthus niruri affect the efficacy of extracorporeal shock wave lithotripsy for renal stones? A randomized, prospective, long-term study.”. J Urol. 176 (3): 1020–2. doi:10.1016/j.juro.2006.04.010. PMID 16890682. (3) Jump up ^ Boim MA, Heilberg IP, Schor N. (December 2010). “Phyllanthus niruri as a promising alternative treatment for nephrolithiasis”. Int Braz J Urol. 36 (6): 657–64. doi:10.1590/S1677-55382010000600002. 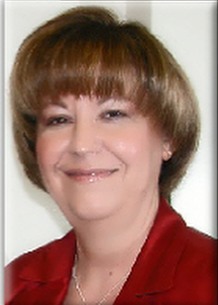 PMID 21176271. (4) Tatiya AU, Surana SJ, Sutar MP, Gamit NH. Hepatoprotective effect of poly herbal formulation against various hepatotoxic agents in rats. Pharmacognosy Res. 2012 Jan;4(1):50-6. doi: 10.4103/0974-8490.91040. (5) Wong, V., et al. “Treatment of nonalcoholic steatohepatitis with Phyllanthus urinaria – A randomized trial.” J Gastroenterol Hepatol. 2012 Oct 4. (6) Londhe, J., et al. “Geraniin and amariin, ellagitannins from Phyllanthus amarus, protect liver cells against ethanol induced cytotoxicity.” Fitoterapia. 2012 Dec;83(8):1562-8. (7) Amin, Z., et al. “Protective Role of Phyllanthus niruri Extract against Thioacetamide-Induced Liver Cirrhosis in Rat Model.” Evid Based Complement Alternat Med. 2012;2012:241583. (8) Srirama, R., et al. “Hepatoprotective activity of Indian Phyllanthus.” Pharm Biol. 2012 Aug;50(8):948-53. (9) Thakur, J., et al. “Enhancing hepatoprotective bioactives of phyllanthus amarus through immobilization by growth promoters and media changes.” Indian J Pharm Sci. 2011 May;73(3):271-5. (10) Sharma, S., et al. “Hepatoprotective activity of the Phyllanthus species on tert-butyl hydroperoxide (t-BH)-induced cytotoxicity in HepG2 cells.” Pharmacogn Mag. 2011 Jul;7(27):229-33. (11) Surya Narayanan, B., et al. “Protective effects of Phyllanthus amarus on fibrotic markers during alcohol and polyunsaturated fatty acid-induced toxicity.” Toxicol Mech Methods. 2011 Jan;21(1):48-52. (12) Chirdchupunseree, H., et al. “Protective activity of phyllanthin in ethanol-treated primary culture of rat hepatocytes.” J. Ethnopharmacol. 2010 Jan 11.